Happy Mondays are an alternative rock band formed in Salford, Greater Manchester, UK in 1985. The band is fronted by Shaun Ryder, who formed the band with his brother Paul Ryder, who played bass. The rest of the band consists of their friend Bez, who danced and played percussion, plus guitarist Mark Day, keyboardist Paul Davis, and drummer Gary Whelan. There are several theories about why the Happy Mondays are called what they are. One is that the band's name refers to what Manchester's unemployed population called the day that welfare checks were issued, or that simply they didn't have to go back to work on Mondays unlike the poor working sods. However, Shaun Ryder did remark in an interview with drug smuggler Howard Marks that the name Happy Mondays was merely a quick solution to naming the band and bears no real relevance atall. The name has no connection with the song "Blue Monday" by New Order, as the Mondays were together and had named the band before this song was released. Manchester pop impresario Tony Wilson discovered the Mondays at a battle of the bands contest held at his Hacienda nightclub. The story goes that Wilson signed them to his label, Factory Records, even though they came in last. Their first album, Squirrel and G-Man Twenty Four Hour Party People Plastic Face Carnt Smile (White Out), debuted in 1987. A number of other albums followed, most of which were released in the United States on the Elektra Records label. 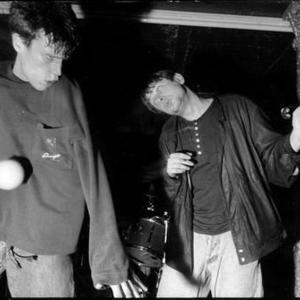 By the late 1980s, the Happy Mondays were an important part of the madchester music scene and personified rave culture. By this time frontman Ryder was fighting a serious drug problem and the band's productivity plummeted. The band is featured in the 2002 movie 24 Hour Party People, with Danny Cunningham as Shaun Ryder. Paul Ryder had a cameo role as a gangster and Rowetta (who sang for the band on Pills 'n' Thrills and Bellyaches and Yes, Please!) appeared in the film as herself. 2004 saw another reformation, comprising Bez, Gary Whelan and Shaun Ryder, following the latter's unsuccessful solo career. The musicians released a live DVD that year of a show in Barcelona, and rumours abounded that the band was recording a new album. The Mondays played a variety of festival dates in 2005 (including Glastonbury), capping it off with a concert at the Manchester Evening News Arena in their hometown.